The race for Governor of Massachusetts continues to feel less than grave. We all know that the REAL Governor is Robert DeLeo, Speaker of the General Court (as our legislature is called). Yet the office which we call “Governor” is filled by a vote of all the people, as that of Speaker is not; and so even if all the people’s Governor isn’t in fact a governor, he or she still embodies what we the people want leadership on. Thus choosing a “governor” is a kind of referendum, not much different from the several referenda that look likely to be put on our state’s 2014 ballot, except that the “governor referendum” is not one-issue specific but an entire menu of issues. So, what are the issues menus on offer from each of the six servitors ? 1. Martha Coakley has yet to tell us what she will do as “governor” that she isn’t now doing as our — admittedly very effective — Attorney General. Perhaps her issues menu is “consumer protection” ? 2. Steve Grossman is just beginning to talk issues. His menu appears — so far — to be “business recruitment, lots of fund raising, and a higher minimum wage.” All good, but much more is likely coming. 3. 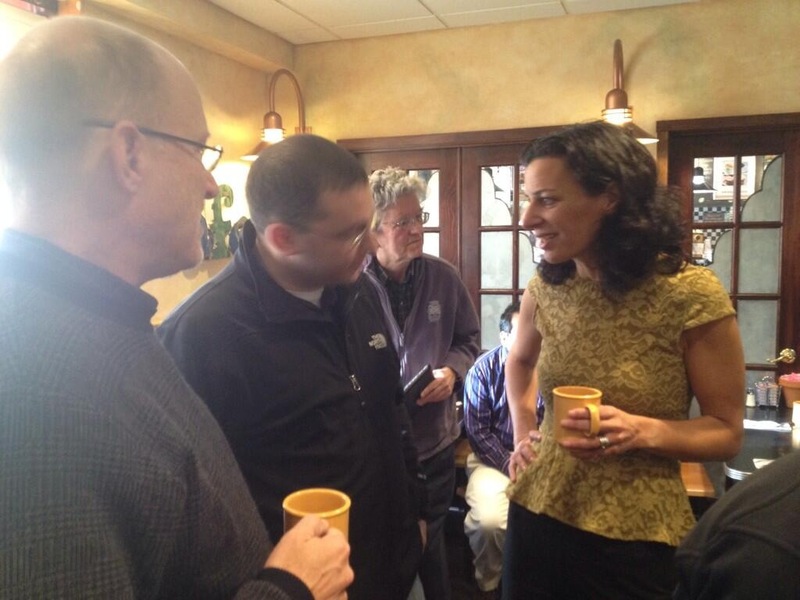 Juliette Kayyem has drawn enthusiastic crowds of Democratic activists and certainly is the charisma champion of the field. It’s a little less clear what her issues menu is. Everybody knows that she was an NSA bureaucrat and wrote expertly — albeit in prose as dry as a month old egg sandwich — about national security issues for the Boston Globe. Who would have guessed that such a sere pen would, in person, exude such fire and warmth ? Perhaps that’s her menu : passion and charm. 4. Donald M. Berwick (see photo above) has, so far, put forth the most inspiring menu : health care as a human right, complete with a cost-control and care delivery plan; business recruitment and a higher minimum wage; and bold leadership on all civil rights issues. He seems to grasp, better than any of his rivals, that the office of “governor” is the issues referendum that I see in it. 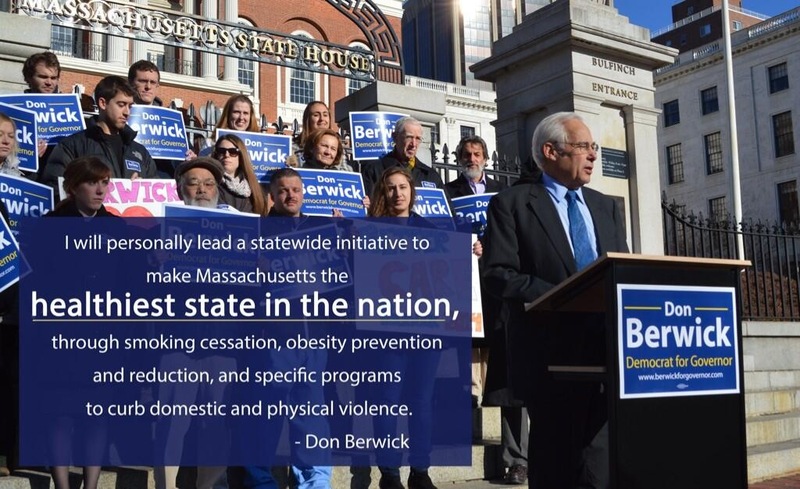 The activists seem to be responding; of late, Berwick’s twitter follower numbers have surged. 5. Joe Avellone says all the right things. his issues menu parallels Berwick’s although with less talk about health care (which is strange : Berwick is an MD, but so is Avellone). Still, Avellone draws smaller crowds and is — and seen as — a huge underdog. Running state-wide for “governor” is a difficult course for anyone as little known as Avellone, whose gentlemanly demeanor only adds to his difficulties arousing serious attention. 6. 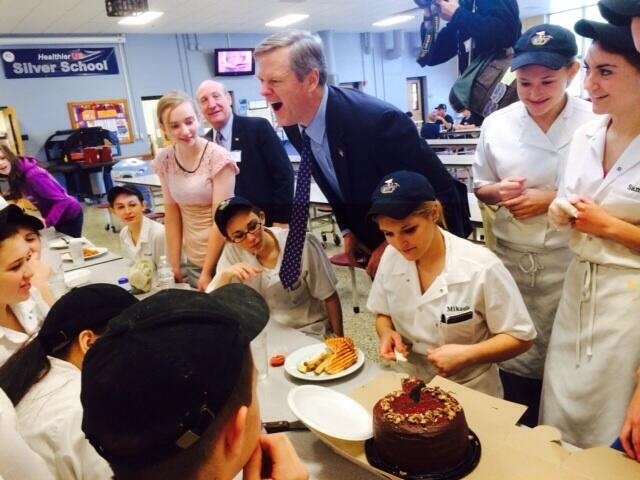 Charlie Baker : his menu we already know from 2010 — or do we ? Unlike then, Baker is taking himself out to the people, doing meet and greets, just as Scott Brown did (and so doing, changed everything about Massachusetts GOP campaigns, which had tended to be press release and stand-out affairs merely, a soft touch of couch potato and hardly serious). Out and about — in Worcester County often — Baker stresses business recruitment (who isn’t ? But how about some innovation district initiatives as well ? ), business confidence, and just a hint of education reform (surely we’ll see more of this from him). He’s also being Mr. Good Buddy, unlike the pissed-off persona he shopped in 2010. The change in demeanor is most welcome and seems to be catching fire. His twitter follower gains trail only Berwick’s and Kayyem’s. The Democratic candidates are amassing issues rapidly; caucus day approaches. Hard to believe that caucuses will convene scarcely 120 days from now ! (According to the State’s Democratic party, they cannot take place later than March 2, 2014. For the Party Rule governing caucuses, follow this link : http://www.massdems.org/wp-content/uploads/2013/08/METHOD-2014_Proposed1.pdf ) Soon the issues roll-outs will give way to caucus commitments as candidates fight each other to secure the 15% of delegates needed in order to earn a spot on the printed Primary Day ballot at which the actual Democratic nominee will be chosen. I will be covering this fight as it intensifies. As with all Republican candidates, so outnumbered in Massachusetts by a host of Democratic hopefuls, Baker is running as if he and all of his Democratic rivals were part of the same selection slot. 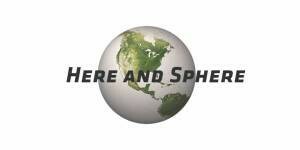 And they are. If the Republican candidate cannot outpoll all the Democratic hopefuls mano a mano, he won’t likely do so at the November election. Thus I am rating Baker on the same stage that I evaluate the five Democrats. One big difference in quality between Baker and the rest : he has run for “governor’ already; they haven’t. He has tested the waters, against an incumbent no less. All the others have yet to prove anything. Most definitely do I include Martha Coakley in that assertion. The way I see it right now, Baker is the favorite to take the people’s “issues referendum” into the State House and get the REAL Governor, Robert DeLeo, to listen to — us. I am not at all convinced that any of the five Democrats can capture DeLeo’s attention, interest, or concern.